Port Washington, NY— Like gears in a giant clock, the new Chronos Chandelier by Modern Forms chimes of daring lighting design. This massive sculptural chandelier is suspended and powered by adjustable ultra-thin aircraft cables for a clean look. The LED luminaire is ideal for high profile architectural, hospitality and commercial environments with tall ceilings and large spaces. 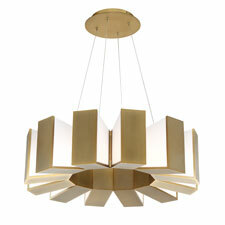 Hand finished in aged brass to complement the latest interior décor, the chandelier is crafted of aluminum hardware with white sanded acrylic diffusers. The LED luminaire operates with a universal 120V-277V driver and dims beautifully with an ELV, TRIAC, or 0-10V Dimmer. The 75-Watt model, with a 50-inch width with a cable length up to 130 inches, delivers up to 2696 lumens using high output LEDs. A 34-inch, 48-Watt version, with a cable length up to 99 inches, is also available. Both chandeliers deliver 3000K illumination with a 90CRI and a 50,000 hour rated life. ETL & cETL listed for damp locations. Engineered to the finest detail for unsurpassed performance and design sophistication, Modern Forms is a future-forward manufacturer and innovative brand of unique upscale all-LED luminaires, and a groundbreaking new line of smart interior and exterior ceiling fans. Modern Forms took North America by storm in the last six years with avant-garde designs that leverage advanced LED technology developed exclusively by WAC engineering. Now it is a leading independent provider of technology and modern design in lighting and smart fans. Modern Forms is designed to complement a diverse array of architectural interiors and exteriors while delivering high quality, functional illumination for luxury homes, hotels and commercial spaces. Each cutting-edge design is lovingly developed by in-house designers to showcase innovative applications of upscale materials and painstakingly engineered for the tangible details that convey quality and years of robust performance. Modern Forms can be reached at 1-866-810-6615 or by visiting or by visiting www.modernforms.com.